Entities have played a role within information retrieval for a long time, with Google improving and gearing efforts towards their recognition since the Hummingbird update, and being able to understand and optimise for entity based search will stand your travel brand in good stead for the coming months, and years. Google have invested a lot of resources into Image Search, and the AI behind image recognition. So how can Google Image Search act as a useful resource in helping you include entity optimisation as part of your travel SEO strategy? The answer is simple, take advantage of image search tags. When you’re conducting normal searches through the traditional Google front-end, you get presented with information such as “people also searched for” and “related keywords”, and these are great – but this is were image search tags differ, these aren’t related search terms – they’re related/associated entities. 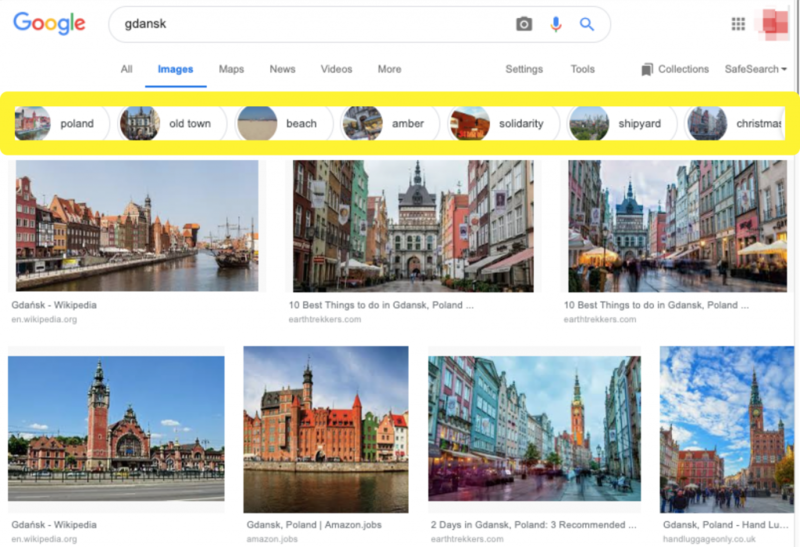 When searching for Gdansk (one of my next holiday destinations), I can see what other entities Google thinks people search for in relation to my main query/entity. This is useful, potentially more useful, than just looking at related phrases and search queries in traditional search, as this takes it to the next level and gives you some insight into Google’s machine learning and how it currently interprets the data available to it’s AI. Knowing that this information is here is half the battle, the second is how to make this information strategically actionable. Alternatively you can present this as a listed table, using colour coded cells ranging from broader entities, i.e. Poland, to more niche and specific entities, i.e. Targ Weglowy. 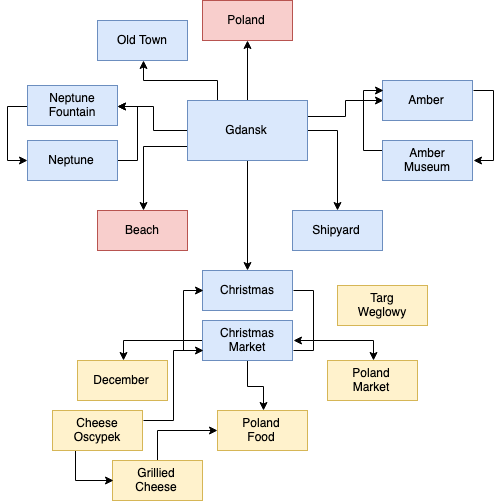 From this mapping, I already know that if I’m going to write a guide to visiting Gdansk in Wintertime, I should mention the Christmas markets, traditional Polish foods (including Cheese Oscypek), as well as other attractions such as the Amber Museum and Neptune Fountain. This information can then be used alongside traditional keyword research and topic research, for both commercial and non-commercial content, to add an element of entity optimisation to your efforts. As well as informing more in-depth blog content pieces. 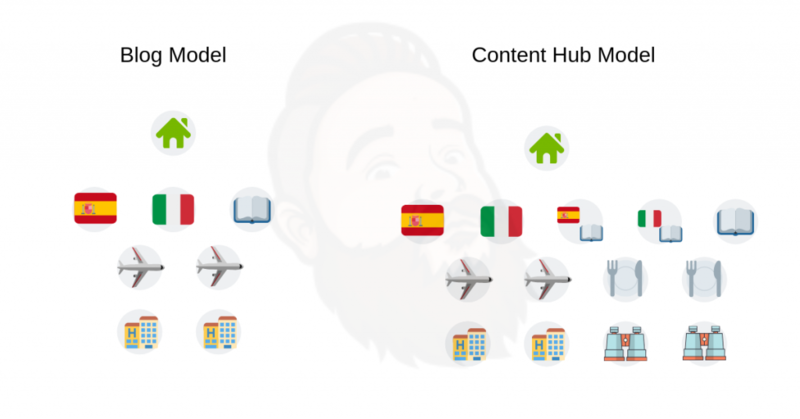 Content hubs and knowledge repositories are not new concepts, in-fact TripAdvisor and Lonely Planet are effectively content hubs first, and commercial sites second. Whilst the content in theory can sit on a blog, and if you offer a single location service then in theory the blog is the best place for it — but if you offer multiple locations, content hubs are much more focused and a lot more powerful. Want more travel marketing insights? You can read my super in-depth travel SEO guide. Feature image is licensed to the public under a Creative Commons Attribution 4.0 license, “Rooftops” by kishjar?.